Canon 400mm f/4L DO lens handheld with the EOS-7D. ISO 400. Center-weighted Average +1 1/3 stops off the sky set manually: 1/2000 sec. at f/5.6. This bird had just–and I mean just–flown past a tree that I cropped out (on the left). Canvas was added right as described in detail in the Digital Basics File PDF. My recommended setting for C. Fn. III-3 (new in the 7D UG update) kept the AF system from picking up the tree. I will be doing four presentations at the Florida Camera Club Convention this coming Sunday morning at Edison State College, Naples, FL. For more information or to register, click here. Jim Litzenberg will be along tending a table of BAA books, CDs, and assorted photographic accessories from BAA Mail Order. If you would like us to bring a major item for you to save on shipping, please let us know of your needs via an e-mail to birdsasart@att.net. Canon 400mm f/4L DO lens handheld with the EOS-7D. ISO 400. Center-weighted Average metering +1 1/3 stops off the sky set manually: 1/2000 sec. at f/5.6. The 7D and the 400 DO is a deadly combination. I got out of the car and walked slowly towards the perch tree to create this image. I am working on updating the Canon EOS-7D Users Guide. It should be done by next Monday, November 8, 2010 and we will have it e-mailed to all purchasers no later than close of business on Wednesday, November 10. If you have a new e-mail address since you ordered your copy, please let us know. If you e-mail us before Thursday, November 11 telling us that you did not receive your 7D UG update, your e-mail will be deleted. Updates to the guide are free so you should get yours provided you are on the list and unless your security settings block it. New folks can purchase the 7D Users Guide here. They will receive the update as above. This is certainly not a prize-winning image but the BreezeBrowser screen capture with Show Focus Points activated shows what I love best about my very favorite 7D AF Selection Area Mode. It works well with both static subjects as seen here and with birds in flight as you will see in the image set below. Canon 400mm f/4L DO lens handheld with the EOS-7D. ISO 400. Evaluative metering +1 1/3 stops off the sky set manually: 1/2000 sec. at f/5.6. Careful readers will note that I had inadvertently set Center-weighted metering rather than my greatly preferred Evaluative metering. Working in Manual mode it did not matter. 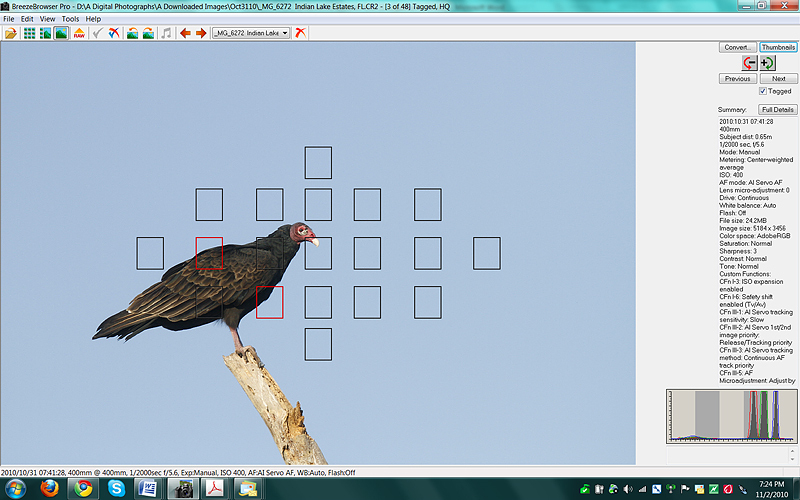 I simply read +1 1/3 stops off the sky (my best estimate based on the principles outlined in the Exposure Simplified: section in ABP II916 pages on CD only), created a test image of a perched vulture, and confirmed the exposure via a histogram check. Note the perfect histogram in the screen capture below. 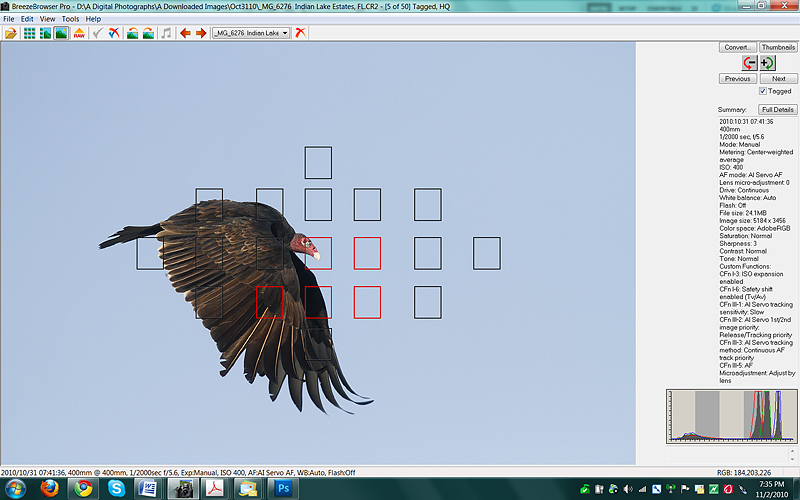 Another BreezeBrowser screen capture with Show Focus Points activated shows that my favorite 7D AF Selection Area Mode also performs flawlessly with birds in flight. Most others recommend against the use of the AF Selection Area Mode that I love and use almost exclusively. D: Thank you for sending the Guide so quickly. D: I have long been an admirer of Arthur Morris. I am always amazed at the quality of his images and consider his ABP I & ABP II to be near the top of the list as far as photographic books go. AM: Thanks. And great values too. Especially the latter. D: But I am disappointed by the guide to the 1Dm4. It offers little new, goes into very little detail and to those experienced with the 1D series of cameras its value is very limited. As the MIV is in many ways similar to the Canon EOS-1D MIII camera body, folks moving to the Mark IV from the Mark III will not be as challenged as those who have used any other Canon professional or pro-sumer digital camera bodies. We have always let folks know that. D: I have also found most fellow photographers willing to simply share their camera settings rather than charging what is in effect the same price that a large book on Photoshop might sell for on Amazon. No one, nobody in the industry has given away more information for free over the past fifteen years, spent more time answering e-mail, spent more time on educational web sites, and just plain helping folks than I have. Period. Nobody is even in second place. There are lots of large books on Amazon.com, some of them filled with photographs, that are lousy at best. If you want weight or volume, I am sure that you can get a few hundreds of pounds of remaindered books from a publisher somewhere for just a few bucks. Our three camera user’s guides consist of a lot more than a list of my settings. I let folks know what settings I use and why and what options might or might not work better for them. It took me more than a week working full time to write the MIII UG, that after using and studying the camera for more than two months. It took me several eight hour days to compile the MIV UG again after using that camera for more than two months. And last week it took me two full eight hour days to prepare the free update. That after probably a dozen hours of work on the improved section on making accurate micro-adjustments. The material in this section will help a lot of folks create sharp images with their $10,000 rigs that would not have been possible without doing a micro-adjustment; how do you put a price tag on that? Preparing the 7D guide took me about ten full days of work after using the camera extensively for six weeks. And that included more than four hours of phone calls with some of the tech reps at Canon. I alone developed many of the fine points covered in the guides that apply to solving specific problems that nature photographers deal with in the field. There is much information in the guides that is simply not available anywhere for any price. The pricing of the various educational products that we offer here is carefully considered and based on a number of factors; the number of words in a book or a PDF, and the number of images included. The length, size, or weight of a book are way down on the list. Near the top of the list are the following items: the effort that went into creation of the project, the number of years of experience needed to produce the information, the quality of the information, the value of the information to potential purchasers, and the number of potential customers. Here are some examples: It took me four years to create ABP II. The work consists of 916 pages and about 900 images, each btw with our legendary educational captions. It contains everything that I learned about nature photography from 1998 until 2006 or so. The information in ABP II is solid. Yet it sells for only $40. Still, there are folks who cry, “$40 for a CD, no way!” Linda Robbins’ Hummingbird Guide is probably 1/20 the size of the ABP II at most, sells for $50. Why? The much smaller audience size and the value of that information to that small audience factored into the pricing of that great guide. And so on and so forth. …..
D: Perhaps the guide combined with the Digital Basics File showing the end to end process might offer some real value. Canon 800mm f/5.6L IS lens with the EOS-1D Mark IV. ISO 400. Evaluative metering +1 1/3 stops off the sky set manually: 1/160 sec. at f/16. This is a stitched pano. I was working on the BLUBB from my vehicle and I could not fit the bird in the frame so I made an image of the right side of the bird and an image of the left side of the bird and combined them using Image/Automate/Photomerge. 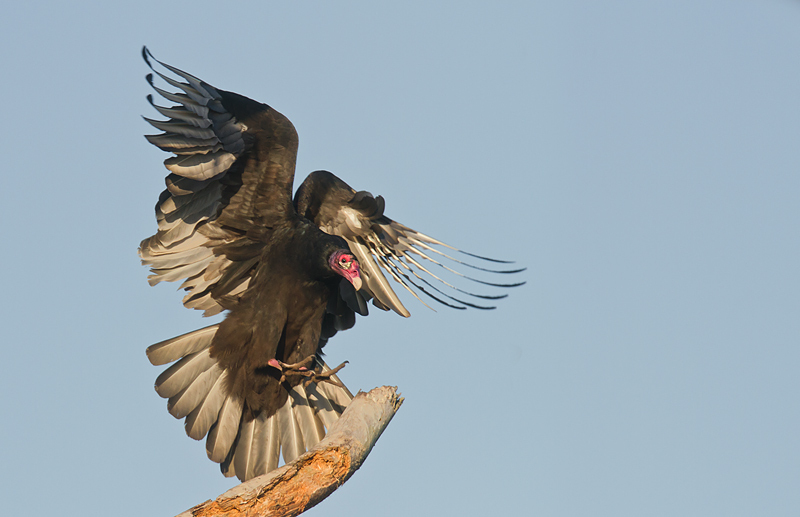 Yes, it is the same bird in the same pose as in the very similar image above that was created with the 7D. Which one has a better head angle? To learn more about Head Angle Fine Points check out my continuing BPN Quiz Thread here. The updated Mark IV Users Guide was e-mailed to the list last Thursday by my older daughter Jennifer, BAAs Executive Director. If you previously purchased the MIV UG and did not receive your update, please e-mail us at birdsasart@at.net and please let us know how you paid. New folks can purchase the Mark IV Users Guide here. They will of course receive the updated version.
. Whenever working on the big bean bag I am using the Double Bubble Level in the cameras hot shoe to make sure that I am square to the world. If you would like to join us (as below) on either the Bosque IPT or the Blurry Day in Bosque IPTs, please call me at 863-692-2806 and ask about the late registration discounts. The Complete Bosque Experience. NOV 20-26, 2010. Slide program on the evening of Friday, NOV 19. 7-FULL DAYS: $3199. Co-leaders: Robert OToole, Jim Heupel, Peter Kes, Denise Ippolito. See additional details below in item last. NOV 27, 2010. Slide program on the evening of Friday, NOV 26. 1-FULL DAY: $399. (Payment in full due upon registration.) Limit: 15/Openings: 10. Leaders: Denise Ippolito and Arthur Morris. Learn to create a variety of pleasingly blurred images of Bosques geese and cranes. Techniques covered will include pan blurs, subject motion blurs, flash blurs, zoom blurs, sunny day blurs, and lots more. This is an offset stitched pano. 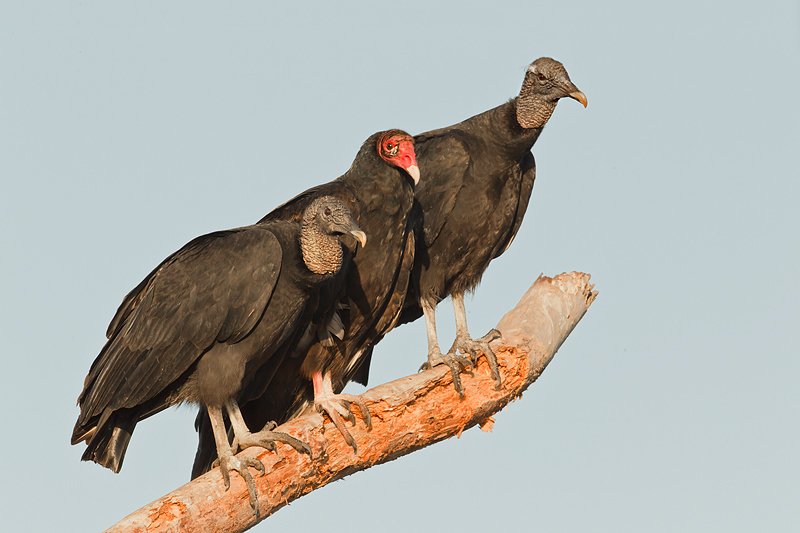 I was photographing all three birds (see the image immediately above) when the Black Vulture on the right moved out on the branch to stretch one wing. Thinking digitally and thinking fast I created two images of the stretching bird and then pointed the camera left and down, re-focused, and created an image of the two birds on the left (with a bit of overlap). I needed to offset the two images and add canvas to each. Here again I was in the Sequoia while working on the BLUBB. For 2010 we are going a bit upscale and will be dining in the New Mexico Ballroom at the Hilton Albuquerque hotel: 1901 University Blvd NE, Albuquerque, NM 87102. Telephone: 1- 505-884-2500. The Hilton is just a bit more than an hour from Socorro. I have group reservations for 11:45am on Thanksgiving Day of course. Right now we have a group of about thirty folks. 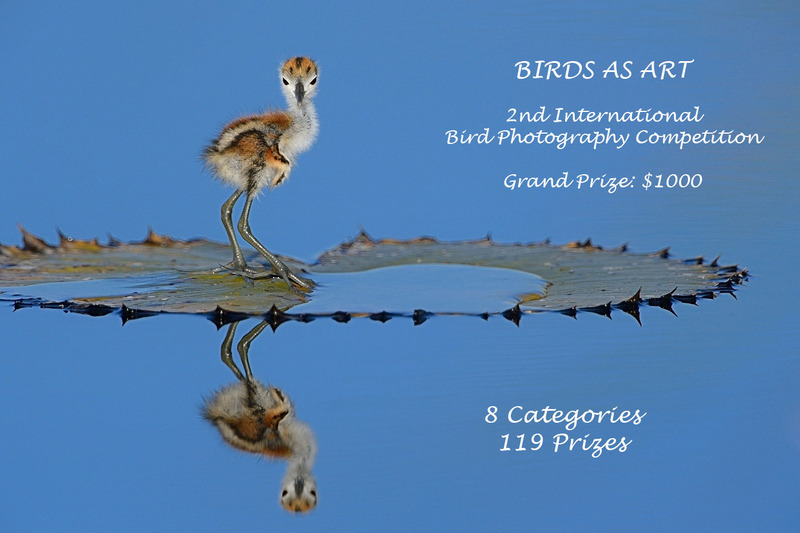 I will be picking up the tab for the IPT group, but as always, all visiting birders and photographers are invited to join us. If you would like to take part in the fun and camaraderie this year please send a check for $40.00 per person made out to Arthur Morris to cover the cost of the buffet that will include the traditional items as well as tax and tip. Drinks are on you. 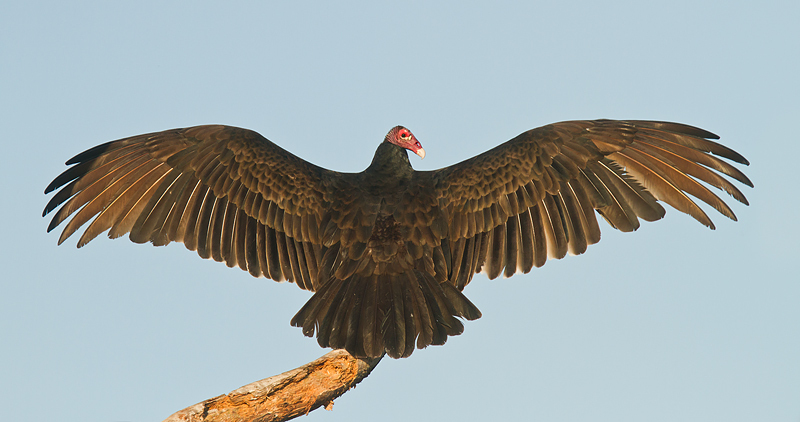 Please mark Thanksgiving Brunch on your check and mail it to; BIRDS AS ART, PO Box 4041, Indian Lake Estates, FL 33855. Sorry, no PayPals or credit cards. I do hope that you can join us. Alex is offering a used Canon EF 70-200mm f/2.8 L IS in excellent condition for sale with the tripod collar, case, lens hood, original instructions, box, and strap) for $1500. This price includes FedEx 3rd biz day shipping to continental US addresses. Cashiers check accepted or pay +2% via PayPal, Visa, MasterCard or American Express. Contact : Alex Alexander by e-mail to alex@PupsAcrossAmerica.com or by phone at 239-671-0740. Canon 70-200mm f/4L IS lens with the 1.4X II TC and the EOS-7D. ISO 400. Evaluative metering +1/3 stop: 1/1000 sec. at f/6.3. 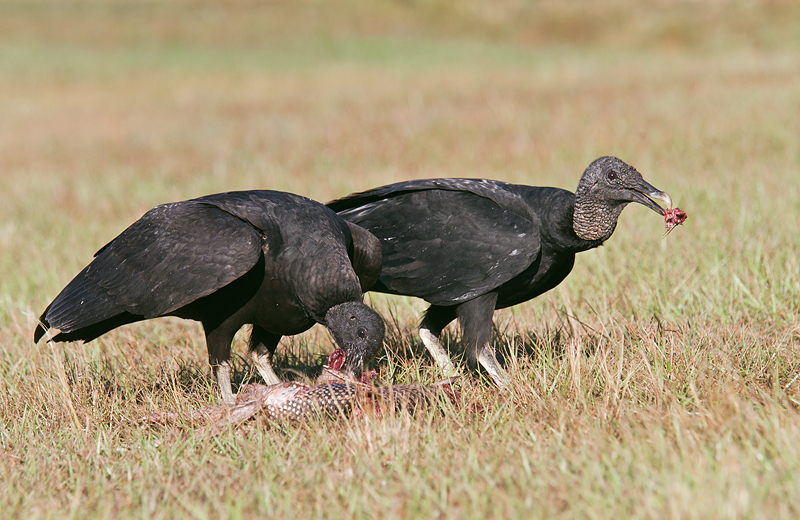 On the way back from the lake to my office/home this morning I came across these two vultures sharing breakfast. I couldnt resist J I was working from the car with the window open for this one. December 3-5, 2010 Three full days of extensive in-the-field instruction at two of East Central Florida’s best avian photography locations. Classroom sessions include image critique sessions each day of images you created during the workshop, proper exposure and compositional techniques, and editing & processing your images. Field instruction includes isolating your subject, understanding light, proper exposure (exposing to the right), using depth of field to your advantage and lots more. 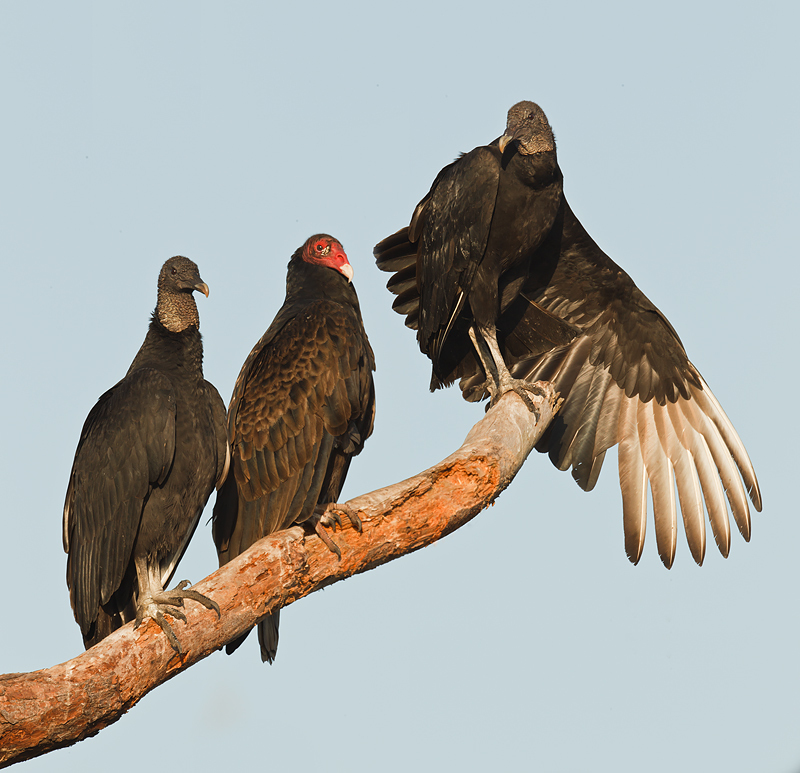 We will also be visiting the Avian Reconditioning Center for a private up-close and personal photography of raptors. CD with lesson plans included no note taking required. Learn more here. Previous Amoruso workshop participants receive a 10% discount on this workshop. Great Blue Heron, three-image stitched pano, Viera, FL. Canon 100-400mm f/5.6L IS lens at 190mm and the 50D. Evaluative metering set manually at 1/1000 sec., f/5.6, ISO 800. Three images were stitched using Photoshop a series created as I panned with the heron as it approached the nest and landed. April 14-17, 2011, Three and one-half days of extensive field and classroom instruction at the famous St. Augustine Alligator Farm with Robert Amoruso and Robert O’Toole. We will be using the Alligator Farm’s Educational Center for meetings and equipment storage between morning and afternoon sessions. 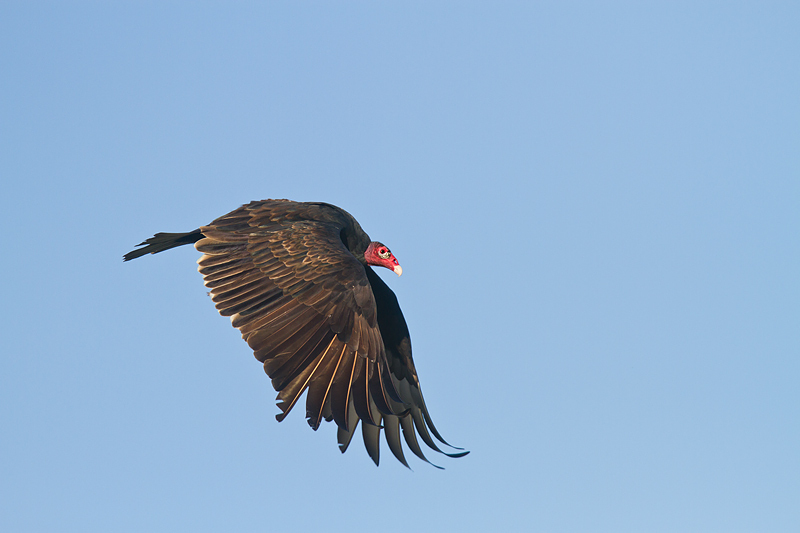 Weather is pleasant in mid-April and coincides with a point in time at the rookery when nesting, chicks, mating and nest building are all occurring – one of my favorite times of the year to be there. Find out more here. As good as a group workshop can be, sometimes private one-on-one instruction is the ticket. My private workshops cater to your individual needs. In advance of the workshop we will discuss your objectives and how they can be met in a private setting. Then I design your workshop to meet those goals. My private workshops generally include areas close to my home as I know them well but I can travel to other locations in Florida if you have a specific locale in mind. Download my brochure here. Find out about where I am photographing, how-to tips, workshop information and more on my blog. Contact Robert by cell phone at 407-808-7417 or by e-mail to wildscapeimages@att.net. The Complete Bosque Experience. NOV 20-26, 2010. Slide program on the evening of Friday, NOV 19. 7-FULL DAYS: $3199. (Non-refundable deposit: $500; see details below.) Limit: 10/Openings: 1. Co-leaders: Robert OToole, Jim Heupel, Peter Kes, and Denise Ippolito. Live, eat, and breathe photography with one of (if not the) world’s premier photographic educators at one of his very favorite locations on the planet. Plus great co-leaders and top-notch Photoshop instruction. Please see terms and deposit info below. Slide program on the evening of JAN 18. 5 Full Days: $2399 (Limit 8/Openings 3). See the blog for a discount on this IPT. Brown Pelicans in spectacular breeding plumage with their bright red bill pouches, Wood and Ring-necked Ducks, Lesser Scaup, Western, California, and Heerman’s Gulls, Marbled Godwit, and lots, lots more. Please see terms and deposit info below. Limit 12 including the leaders/Sold Out. 5-FULL DAYS: $3249/Sold Out.